Erwin Insurance Agency® provides comprehensive insurance options throughout Florida, New York, and 15 other states, with offices in Jacksonville and Fleming Island in Florida, and New York City. Your family, your business, and your possessions are all important to you but you may not perfectly understand how and when insurance can apply to protect their value. We have the experience to navigate the unique risks you face, serving as your insurance advisor. Insurance as compliance, reliance or strategy? Founded in 1963, Erwin Insurance Agency® is a commercial and personal lines insurance agency providing services throughout Florida, New York, and 15 other states. We have offices in Jacksonville and Fleming Island, FL as well as an office in New York, NY . We have spent 55 years in the industry, developing expertise and relationships with insurers and risk service groups. Over that time, we have developed a deep appreciation for the purpose we serve: to help you transfer and manage unpreventable risks. Our vision is to change your perception about insurance, from necessary evil to the smartest way to protect more of what’s important to you. Customers before commissions – we won’t sell you coverage you don’t need. Details before deals – we won’t submit applications without the right data. Creativity before calling it – we won’t give up if your needs are unconventional. Simplified without under-complicating it – we’re here to help you make decisions about complex products. Our philosophy? To recognize the distinction between data and information, and know how and when to use both. Understand that customer support is the means to customer retention. Data is great. Data with context is unbeatable. We combine our deep domain expertise, detailed data collection and long term relationships to see the bigger picture for our customers – not just what you need now, but what you might need in the short and long term. Customer support is a given. Customer retention is a differentiator. We believe customer retention is the foundation to a sustainable insurance agency and we take it very seriously. So serious in fact, we’ve celebrated our 55th year serving our customers, some of whom have trusted us for five generations. Signing a new customer is often considered multiple times more expensive than retaining an existing one. And that notion underpins everything we do at Erwin™. We cannot and do not focus only on winning new customers every year. We have to win our existing customers over again first. And with that, our logic is that support leads to satisfaction, and satisfaction leads to retention. That’s what we’re all about, and to that end, we don’t view support as a differentiator. Support is just a part of our DNA. Navigating the complex and sometimes cryptic world of insurance while remaining conscious and respectful that its products are squarely at the intersection of finance, actuarial science and the law. Also serving the areas of Miami, Orlando, Gainesville and Sarasota. At Erwin Insurance Agency®, our mission is very simple. We strive to provide a true, concierge client experience which is unique in the insurance industry. We give clients the power of choice from top-rated national and regional insurance carriers. We offer comprehensive insurance solutions throughout Florida and New York with offices in Jacksonville, Fleming Island and New York City. 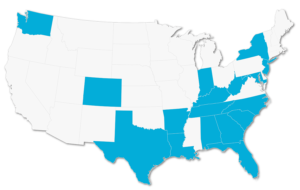 We are licensed in 17 states.